Cor-Ban 35 is a long lasting, high solids and low VOC CIC with high penetration capability and water displacing properties. Applied in a 1.5 to 2 mil wet film thickness it dries in less than one hour to a non-tacky, salmon pink color. 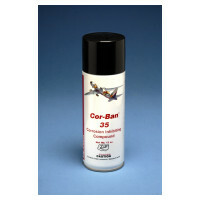 Cor-Ban 35 incorporates the best features of BMS 3-23 and BMS 3-29 approved products. The product can be applied by conventional airless or air-operated spray equipment. The coating should be applied at 1 - 1½ mils wet thickness. Aerosol application is available. All properties represented were achieved with a dry film thickness of 0.75 mils.